TJDP 70 heavily covers related topics. 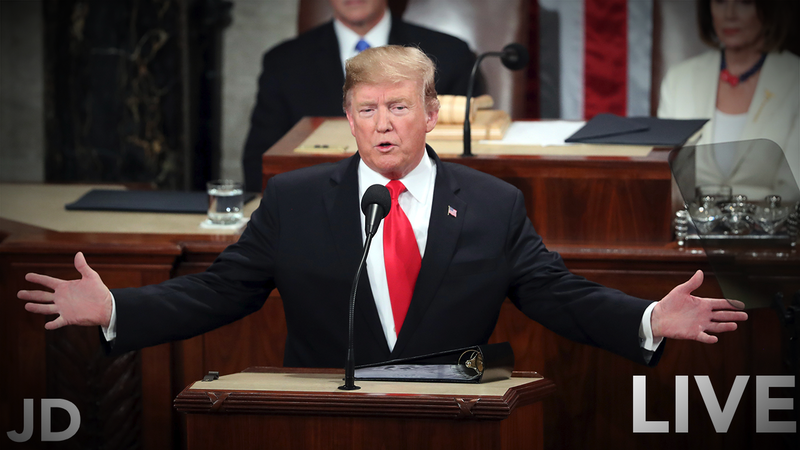 Donald Trump delivered The State of The Union last night in the House Chamber as he stood in front of House Speaker Nancy Pelosi and Vice President Michael Pence. Minority Support was very evident in The State Of The Union, and in my unsolicited opinion sounded better, or at least more powerful coming from a republican. Among many things, Trump spoke of the growing amount of women not only in the workforce but also in congress. Many of the women, who were dressed in white in protest of Trump stayed mute throughout the whole speech. This is nothing new although when trump mentioned the record-high statistics for job growth and congressional leadership for women, they clapped and danced in joy. Trump opened up his speech by calling for bipartisanship. He did so by “hoping that we will govern not as two parties but as one nation.” Expectedly, Democrats and Republicans gave Trump a large cheer after this statement. Finally, Trump said “victory is not winning for our party. Victory is winning for our country”. Cheers from both sides came as that proud statement was made. Overall, Trump needs to take action on his words. He will say all of this in an eloquent manner but the next day, you will see him tweeting about something… say presidential harassment? Nixon! Nixon! Nixon! Not much more needs to be said, but that line reminded me of the re-runs I watched of Richard Nixon responding to the supposed allegations as the “watergate” scandal arose. “I believe the time has come to bring that investigation and the other investigations of this matter to an end” Nixon said. Nixon was forced to resign six months later. Donald Trump basically said the same thing, just simplified it into 116 characters. Or… an attack on socialism. Trump went on a pre-written rant about socialism, which I think was well deserved and well written. I say that only because I like capitalism; not republicanism. The camera cut right to Bernie Sanders as Trump made these remarks. In conclusion, the topics discussed on this years State of The Union were important, and like I said on TJDP, “if you based his entire presidency off of that one speech, you’d vote for him easily”. That is a problem; especially because this was one of the only times where Trump strictly stuck to the prompter the whole speech.